The Republic of Georgia is one of six nations considered part of the Caucasus biodiversity hotspot, which encompasses the isthmus between the Black Sea and Caspian Sea and nearby areas. The former Soviet Union was largely isolated from the rest of the world for many years, and this isolation was also botanical. Although people around the world can now visit its alpine meadows and high mountain oak forests, development pressures have accelerated, with natural resource extraction proceeding at a rapid pace. Political and economic upheaval have contributed to this acceleration, and poaching of wildlife, fuel wood, timber, and plants have increased significantly. Infrastructure development, such as roads, dams and pipelines have fragmented and degraded habitats. In the wild this iris is found in the area of Mt. Lomtismta, now a reserve, and it was once found in Abkhazia as well. 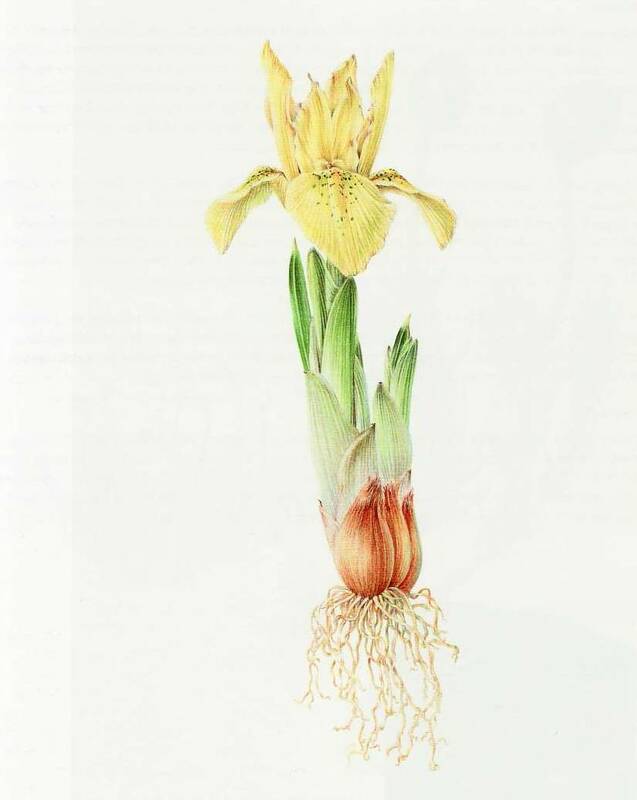 Iris winogradowii has a number of unique features for an iris; it has a bulb rather than a rhizome, its leaves are triangular in cross-section, and it dies back completely by mid-summer. The Karamov Botanical Institute published a massive 30-volume Flora of the USSR during the mid twentieth century. The purpose of my art is to capture the unique features of plants and to engender appreciation for contemporary botanical art and accurate realism. My academic background as a botanist influences the plants I choose, as well as my compositions and painting style, and I enjoy searching out rare and unusual plants.